Maybe you’re starting out with a VA that helps handle customer service issues and anything else “office work” related, and a writer that helps you with content creation. Eventually your first VA will grow into your main project manager who handles dealing with a team of writers, editors and graphic designers and that original writer is now your main copy writer. By growing your team right along-side you and sharing your vision all along, you will cultivate relationships where the work seems effortless. You don’t have to go into a lot of detail to convey how you want the sales page for your latest product to flow. Your copy writer has been working with you for months or even years and has learned the craft of writing compelling copy right alongside you. He or she knows your style and knows your target audience as well as you do. And your project manager is keeping everyone on track so you don’t have to worry about all the little details. Remember, that’s the end goal. It won’t start out that way, but if you treat your team members right, involve them in the business and help them grow right alongside you, this can be your future. Help Your Team Grow Closer With Team Building Exercises Let’s wrap this up with a little bit of information on traditional team building exercises. The reason large corporations use them again and again is because they work. They help bring the members of your team closer together, form relationships both with you and each other. And that builds the loyalty, cooperation, collaboration and appreciation we talked about earlier in this report. 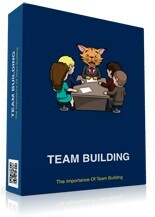 Since most of us work with virtual team members, these team building exercises are designed to work virtually. You can easily adapt them to a regular office environment or do a quick Google search for Team Building Exercises or Team Building Games to find more. This is a great ice breaker and perfect for a first virtual team meeting. This will work well on a conference call but is even better on a video conference. Schedule a group Skype call or set up a Google Hangout for your meetings.